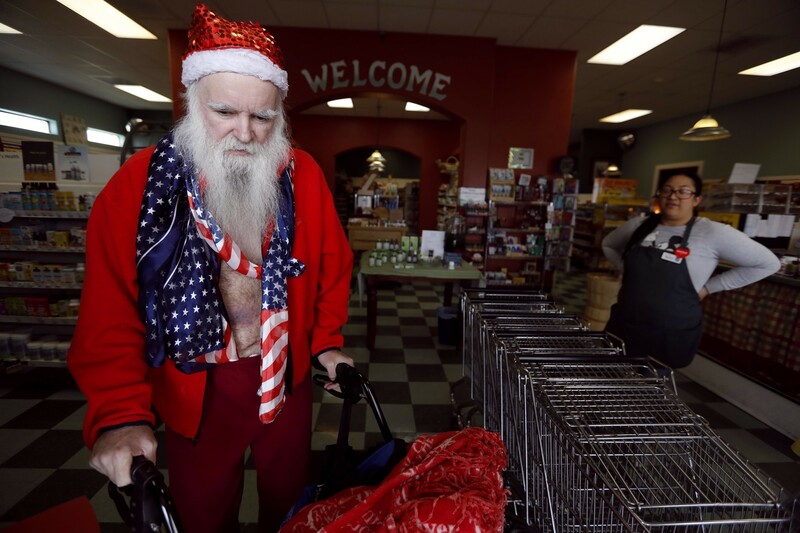 In Kingman, Ariz., residents have embraced an eccentric character who goes by the name James Zyla, even though most people call him Santa James. Longtime homeless and legally blind, he’s found a home in Kingman. For years, the white-bearded man in the red Santa Claus outfit has been a familiar sight around this isolated high-desert town, his habits so routine people take notice when he’s not there. In triple-digit August heat and on frosty January mornings, he pushes an overloaded cart along congested Stockton Hill Road, his companion toy rabbit riding shotgun, trundling unsteadily between his haunts at supermarkets, fast-food joints and coffeehouses. Who is this character, this man in scarlet, people once asked. Is he homeless? Does he have substance or emotional issues? He seemed harmless, because not once did anyone see him stick out his hand to beg, bother or steal. And no, he didn’t need a handout. He was just a musician who wanted to play the electronic keyboard that never leaves his side. Slowly, in this town of 25,000 mostly retirees and blue-collar workers, where untethered wanderers roll off Interstate 40 like so many tumbleweeds, residents let down their guard for one peculiar 68-year-old man few call James or Zyla. Here, he’s Santa James. In an era when American cities struggle with their homeless populations, Santa James is celebrated, embraced like a long-lost friend. People offer him gift certificates to Starbucks and McDonald’s, hand him a cup of coffee or bottle of water, buy him new Santa-themed clothing, including a stylish red hat with sparkly sequins. After residents learned he’s legally blind, they started to keep watch when he negotiates four-lane roads by sound and memory, the vehicles whizzing past merely a blur. His Facebook page, which he updates on his iPad and fills with recollections and fiction, has more than 4,000 followers, many from Kingman, who cheerfully call out when they spot him around town. “It’s me, Santa James,” they’ll say. And once they give their names, he always places them. His mind will wander a bit as he recites poems or recounts — for long stretches, non sequiturs galore — stories from the road. But tell him your name once, and he will remember you. There’s something about Santa James — in his wandering stories, his Facebook posts, his demeanor — that touches people here, leaving them to marvel at his boyish wonderment of life. Cathi Bent, a friend, recalled sitting with the musician one night along the Colorado River in Laughlin, Nev.
Pat Barry and his wife, Judy, both 76, moved to this city six years ago after selling their two gas stations in the San Fernando Valley. The combination of Kingman’s neighborly vibe and Santa James’ exuberance makes the relationship work, they say. Another lady offered to do my laundry, and took me to the cleaners. Just another day at the Mandalay Bay. Soon after they met, Pat learned Santa James walked the streets at night, so he parked a van in a Safeway parking lot on the homeless man’s route so he’d have a place to sleep. At first, Pat retrieved the vehicle each morning. Eventually, he left it there for more than a year, and gave Santa James the keys. He also took him to a truck stop for an occasional shower while Judy dutifully washed his clothes. The couple also participate in a carpool that drives Santa James 30 miles to Laughlin, where twice a week he plays the grand piano in a casino bar for tips. Now, Santa James is a regular dinner guest. “Thank you both very much,” Santa James replied with his proper British manners. In time, Kingman’s favorite wayfarer exposed more of his colorful past. Decades ago, he said, he played in a band called West One that performed in the same concert with Thin Lizzy in Newcastle, England. Another band he played with, Society’s Child, once opened for the Troggs at the famous Marquee Club in London. He can play anything on his keyboard, he says, from rock and blues to country and Broadway tunes, and writes songs he says are influenced by music he heard on the radio growing up in England. By the 1980s, Santa James was selling real estate in Orange County and working in a store that sold computers and pianos. Then one day he spotted an ad at Blockbuster video for a Hollywood extra. For years afterward, using his real name, James Godfrey, he got work in film and TV. The Screen Actors Guild confirmed his membership. Eventually, he walked away from Hollywood and, as he put it, ventured into the unknown world in search of the old musicians with whom he’d lost contact. For a while, he lived out of his car, taking odd jobs. In 2009, however, he began to lose his eyesight — an event perhaps connected to a fall off a stage in Bullhead City, Ariz. — and he could no longer drive. Before he landed in Kingman in 2014, a motorist in Bullhead City saw him walking along the road and handed him a Santa Claus outfit. He decided to adopt the look. Santa James avoids checking accounts, rent payments and what he calls the hassle of collecting Social Security checks. He hasn’t had a drink since 2008. He insists he goes days without sleeping, and claims that he once played piano for 100 hours straight in a radio stunt. In his travels, he’s run into the generous and the unkind. One summer day, a motorist yelled, “Hey, fool, Christmas is in December!” At the next traffic light, a boy called from a bus window, asking if he could have a trumpet for Christmas. Among his defenders and fans are the Kingman police. Officers stop to check on him, or ask him to recite a poem. The warm reception given to Santa James shows a gentler side of a town criticized last year when Kingman was shown in Sacha Baron Cohen’s social satire program, “Who Is America?” Residents say the community’s spirit was misrepresented when a handful of people expressed anti-Muslim sentiment at a public meeting. Sometimes, Kingman comes together to help out Santa James. Last fall, high school senior Kaylene Purcell was researching an English project when she thought of Santa James. Her class was reading the play “The Crucible,” which explores the Salem witch trials, and students were seeking examples of people who live on society’s fringes. “And I thought, ‘What about James?’ He’s different, but we love him,” Purcell said. She invited Santa James to her school to ask him about being a perceived outcast. At first, in a taped half-hour interview with her two project partners, Purcell tried to ask a few straightforward questions. He replied with a series of madcap stream-of-consciousness and unconnected tales, a typical Santa James gabfest that often made Purcell’s eyes widen. She simply could not get a straight answer. “What brought you to Kingman?” she asked at one point. But afterward, before the class, he connected with the students in his own Santa James way. He played the Beatles’ “Let It Be” on his keyboard, along with an original instrumental inspired by a hard-living friend named Daphne, a bartender who died breaking up a knife fight. That night, Purcell approached manager Larry Backer at the Canyon 66 Restaurant, where she works as a waitress. Would he hire Santa James to perform there? Backer agreed. In exchange for playing once a week, the musician was given a room at an adjoining hotel. He still likes to wander the streets with his cart, but now he has a regular place to stay. James Zyla spends a quiet moment with his thoughts in his room at the Ramada Hotel in Kingman, Ariz.
Zyla practices songs on his keyboard in his room at the Ramada. 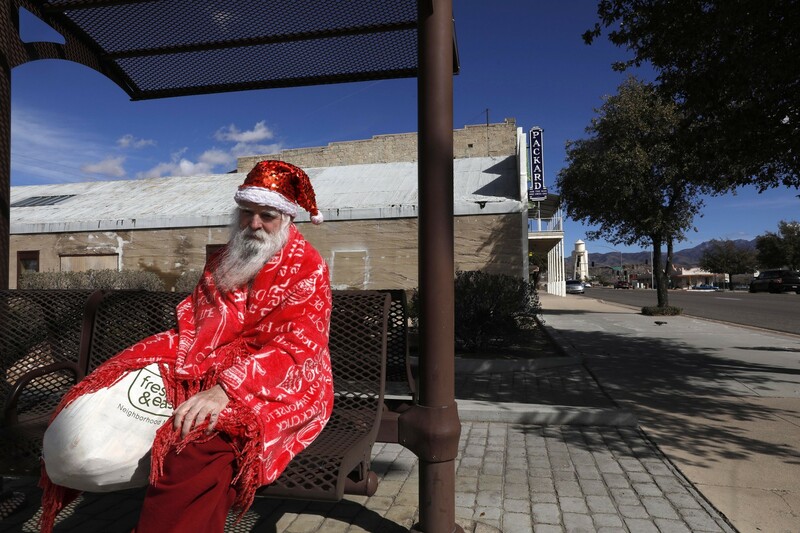 Even so, Santa James doesn’t know how long he’ll remain in Kingman. When you’re on the road, he says, every gig is a one-night stand. Recently, at a gathering Pat Barry organized for residents to meet a reporter with Santa James, retired aerospace worker Becky Brooks told of how she met him. She had read one of his short stories on Facebook about a girl who loses $1 billion at the racetrack on a horse named Birthday Cake. Anyone who liked the story, the post ended, should stop Santa James on the street and say the horse’s name. “You read that story?” said the man in red, obviously pleased. Brooks knew she’d made a friend. She drove him to Home Depot where they found a baby stroller on sale, one with lightweight rubber wheels for parents who like to jog with their infants. She used PVC piping to fashion a custom-made cart that includes a large bin for his belongings, along with side pockets and handlebars. As the gathering broke up, Brooks embraced the near-blind man in the sequined Santa’s cap. It was another long, warm, gentle hug. Glionna is a special correspondent. Additional credits: Produced by Justin L. Abrotsky. Video edited by J.R. Lizarraga.